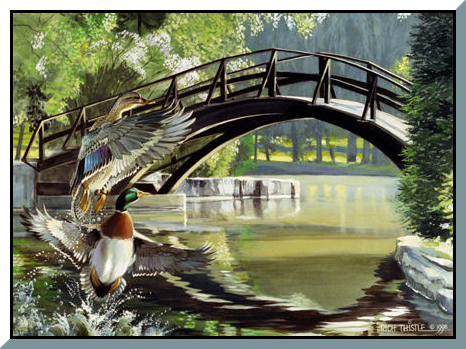 This public art installation is comprised of 23 original paintings by Rich Thistle©. 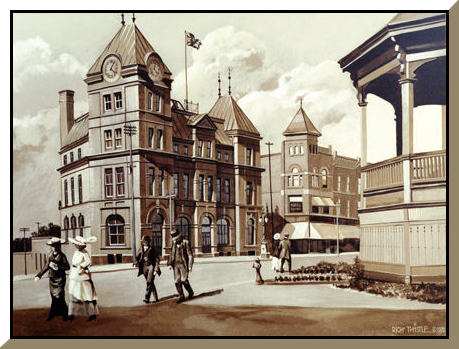 Images depict historic and contemporary scenes of Stratford Ontario. 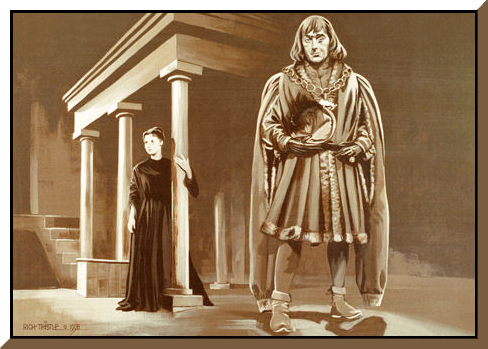 Commissioned in 1998, these acrylic works were created using sepia tones for the historical scenes and full color for the contemporary images. A tribute to historic and current Stratford, the work is permanently mounted across the front facade of STRATFORD PLACE, in the heart of downtown. 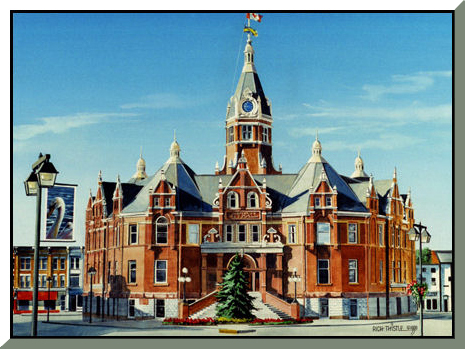 Nov. 2, 1998 marked the one-hundredth anniversary of the most unique Victorian City Hall in all of Ontario. Its beautifully restored condition gives no hint of its near destruction at the hands of its own elected councils between 1964 and 1974. A determined citizen's committee stirred a sense of public outrage at the prospect of such a travesty forcing council to renovate and repair, spelling the end of plans to demolish the building and saving this gem of public architecture. 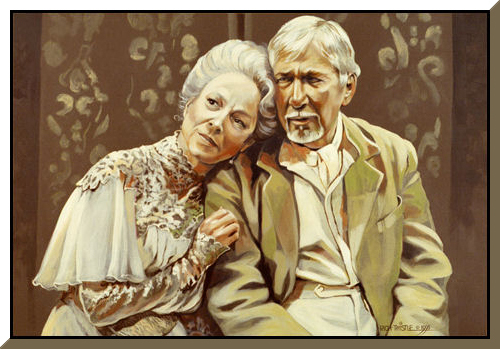 Legendary Canadian stage actors Martha Henry and William Hutt comfort one another in a scene from the Stratford Festival Theater's 1994-95 production of 'A Long Day's Journey Into Night'. Ms Henry and Mr. Hutt also played these roles in the movie version. 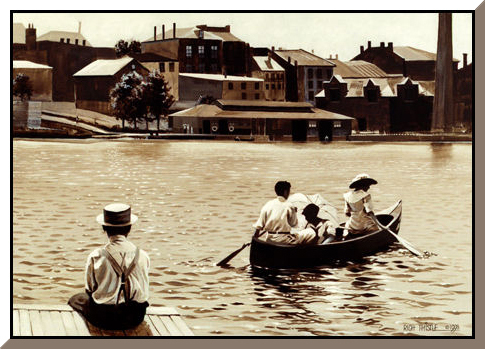 1917 view of the old boathouse from the north shore of Lake Victoria (Avon River) suggests the relaxation and restoration which water provides those who are drawn to it.The boathouse is still in existence. Mallards explode from the quiet of the Avon River by the Tom Patterson bridge in Stratford's beautiful park system, a touch of nature in the heart of the city. 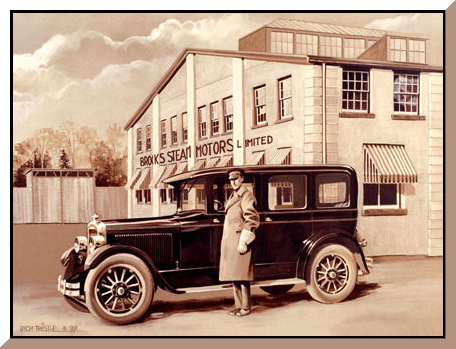 Stratford's only bid to build cars was the Brooks Steam Motors Ltd. which opened in 1923 & ran out of steam in 1927. During that time 180 Brooks Steamers were built selling for $3000 each, a king's ransom in those days. The original building on Ontario St. at the entrance to Queen's Park was torn down in 2001. Only a few cars remain, including one brought back to Stratford Ontario by the Perth County Historical Foundation. Stratford is the seat of the county of Perth in the heart of some of the richest agricultural land in the world. 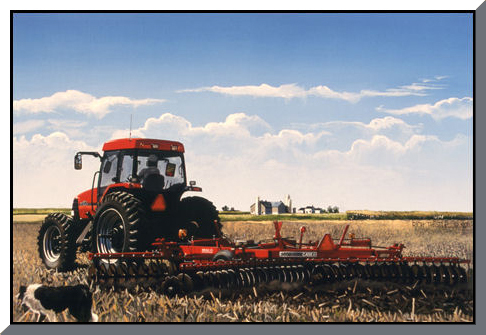 This Case IH 135 tractor & implement symbolize the modern outlook of farming as family industry carries on in the ongoing spirit of the pioneers who cleared these lands over a century ago. The massive CNR locomotive'6218', built in Montreal circa 1942, was the last engine to be refurbished at the CNR repair shops in Stratford before they closed in 1963. For almost 100 years, Stratford was 'a railroad town'. This beautiful, contemplative little corner of the park system, designed in the style of a Japanese water garden, is almost hidden near Gallery Stratford. 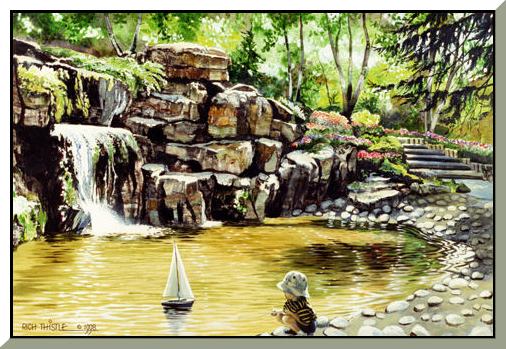 A gem of garden architecture worth seeking out. 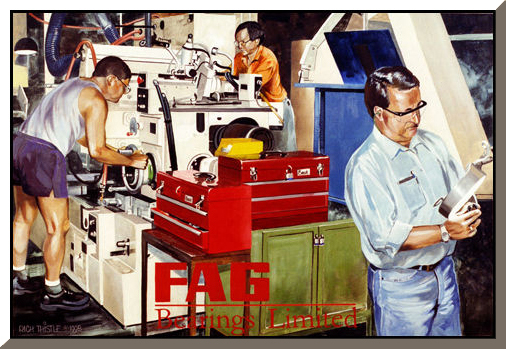 Chosen to symbolize the ongoing importance of industry in Stratford, FAG Bearings Ltd. is a model of modern manufacturing. This strong international company is one of Stratford's oldest & Largest employers notable for their admirable record of corporate citizenship. 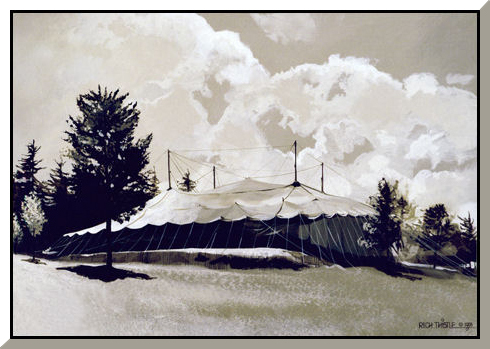 They were very pleased to be included in this series and were most helpful to the artist. The exceptional park system is a key part of the Stratford experience & feeding the swans seems a tradition worth continuing. There are probably few family photo albums which do not contain such memories. 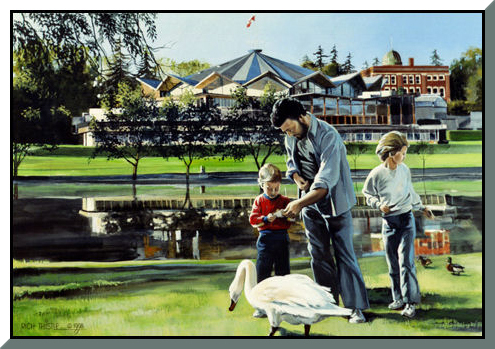 Here the artist chose to use a 1981 family photo of himself and his two children as a reference for this painting. 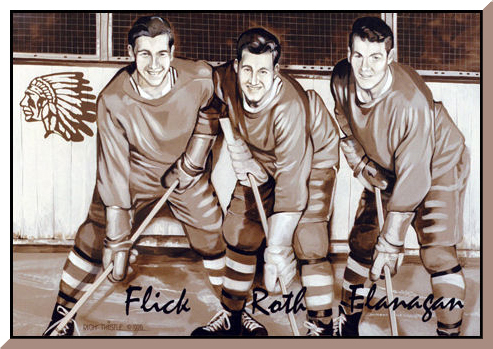 Billy Flick, Lyle 'Mickey' Roth and Dennis 'Dinny' Flanagan are shown here in their practice jerseys while playing for the OHA Senior A Stratford Indians. This line was a legend during their years together from 1951 - 1957. In 1951 they were picked for the Lethbridge Maple Leafs team & helped give Canada its 13th world title in senior amateur hockey. Of course the Stratford hockey tradition continues to this day! 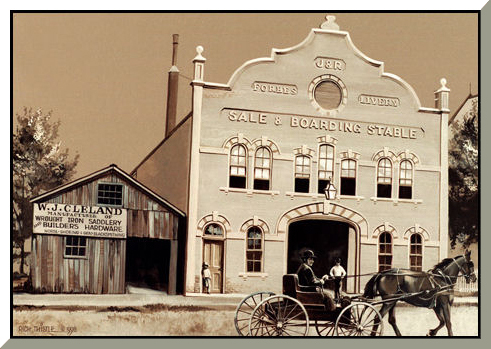 At the turn of the century, J & R Forbes Livery & Stable & the W. J. Cleland blacksmith shop were located side by side on the site now occupied by Stratford Place, the building on which these twenty-three paintings are mounted. Before the larger building was torn down in the sixties it served as a popular bowling alley. 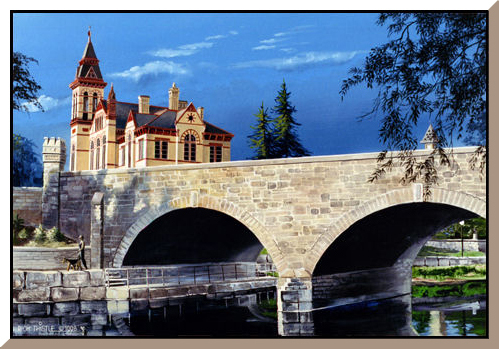 This dramatic view of the Huron St. stone bridge, built in 1885 to celebrate Stratford's incorporation as a city, frames the architectural beauty of Stratford's Perth County Courthouse, a building of considerable presence & beauty. 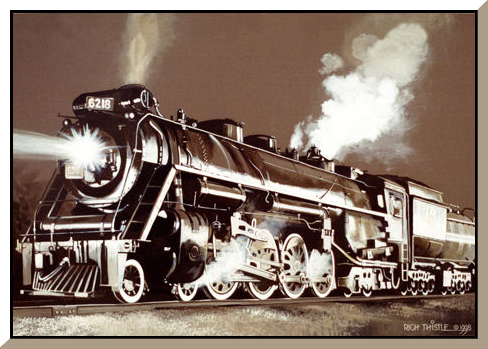 The Grand Trunk Railroad wood burner 'Toronto' was the first steam locomotive built in Canada. 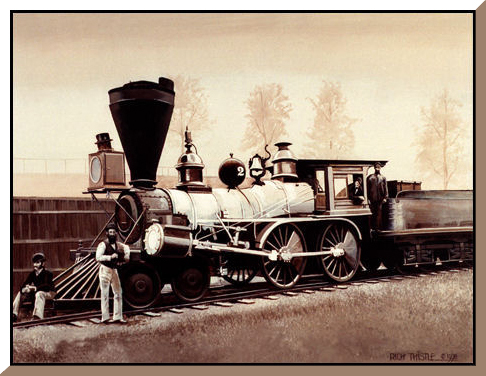 Manufactured in Toronto circa 1853, it was probably the first steam engine to pass through Stratford on a scheduled run when the Grand Trunk reached the town in 1856. 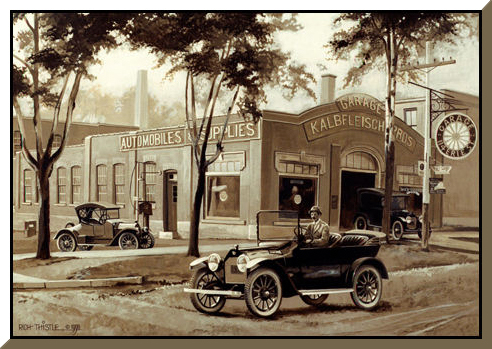 A nostalgic view of Kalbfleisch Bros. garage & car dealership on the northwest corner of Erie & St. Patrick St. as it looked in 1915, was owned & operated by 3 generations of the Kalbfleisch family, in the same location, until 2004. Stratford grew from its agricultural roots. During World War II, a friend of the Thistle family, Lloyd Morrow, was seconded from the RAF to De Havilland aircraft company in Toronto to test-fly Mosquitos. 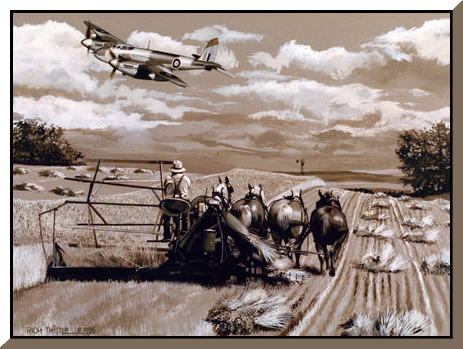 Among his test-flying adventures were visits to the home farm. Wooden parts for this aircraft as well as the Lancaster bomber were manufactured in Stratford at Kroehler Furniture and Imperial Rattan Furniture. In the late thirties, near the site of the Thomas Orr dam, a touch of Greek architecture provided an interesting contrast to its natural surroundings on the banks of the Avon River. The pergola graced this scene for a very few years before it was lost in the flood of 1937. 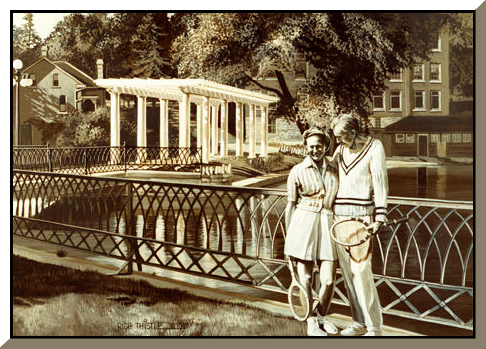 The couple posing in the foreground show evidence of the strong presence of the sport of tennis in 1930's Stratford. Remembered fondly by Stratford's citizens, this impressive federal building stood proudly on the north side of main street from 1882 until it was demolished in 1961. Its strong 19th century design became a proto-type for post office buildings across the country. Memorial Park now occupies this site opposite the Erie St. junction where once stood the wooden 'Band Shell' shown in the right foreground. 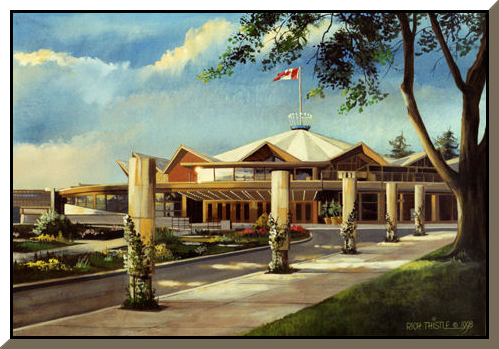 Proudly overlooking the Avon River, the Stratford Festival's main theatre building was the subject of major renovations in 1997 thus restating modern world standards in theatre design both front & back stage. Stratford's 4 theatres attract more than half a million visitors each year to the world-class productions presented by its internationally respected repertory company. Swans are beautiful, stately birds with strong family instincts & their presence on the Avon seems somehow to recall Stratford's connections to the England of the past. It is now famous for its Mute swan population which has graced its waterway since the early thirties. 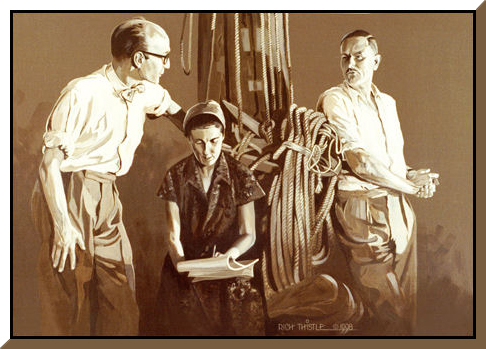 Tom Patterson, festival founder, Tanya Moiseiwitsch, designer of the thrust stage, & Sir Tyrone Guthrie, the Festival's first director, share creative visions together under one of the main tent rigging poles in preparation for the first season at the Stratford Shakespearean Festival in 1953.